The Seahawks were left questioning the maturity level of last year's top pick, Malik McDowell. There should be no such questions surrounding Rasheem Green, who overcame a speech impediment and a knee injury to become a star at USC. 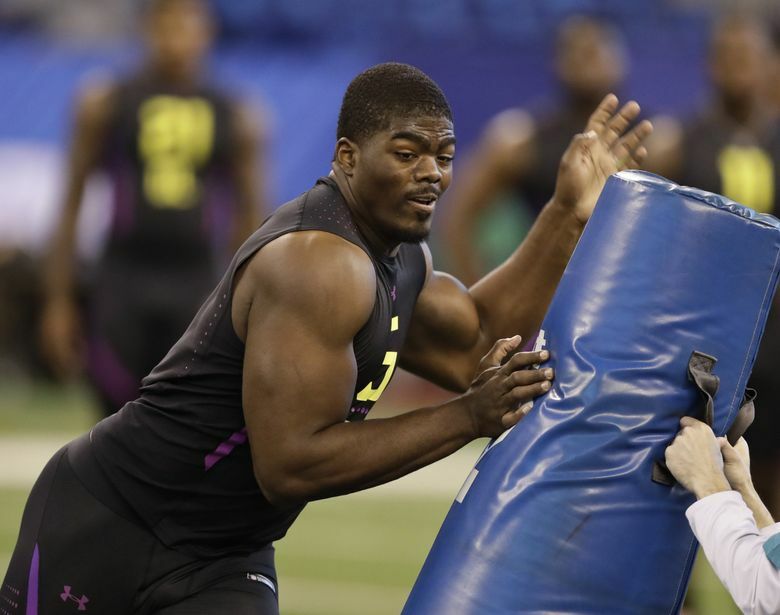 In one sense, Rasheem Green — the newest Seahawk after the team selected him in the third round of the NFL Draft Friday night — hardly has the resume of someone who has spent his life having to prove a whole lot to anybody. A standout at Serra High in Gardena, Calif. — one of the more-storied high school football programs in the talent-rich Los Angeles area — he became a five-star recruit who signed with even-more-storied USC. There, he broke into a significant role as a true freshman, scoring a touchdown on a fumble return against UCLA when he was just 18 years old. He started the next two years and after recording 10 sacks as a junior last season declared early for the NFL, a decision debated by few — most draft projections considered him as a possible late first-round pick. But the football bio doesn’t tell the whole story. Green was saddled with a speech impediment as a young child, which he once said in an interview with the Los Angeles Times resulted in him clamming up for years. “Having it made me a real shy person,” he told the Los Angeles Times. Green also suffered an ACL injury late in his senior year at Serra that required reconstructive surgery as well as a reported clean-up surgery later by doctors at USC. But just as he overcame the speech impediment, he also recovered from the knee injury to play 39 games in three seasons for the Trojans. “He’s been playing on it for years,’’ Seattle coach Pete Carroll noted Friday night. The knee, though, apparently proved enough of a worry to cause Green to fall from a possible late-first or early-second pick to number 79 overall. Seattle decided it was no longer a concern after giving him an MRI during a private visit a few weeks ago and declaring the knee stable. Watching the draft at home in Los Angeles, Green called the slide disappointing. What it also may be, though, is the kind of thing that could continue to gnaw at Green and drive him to show NFL teams that passed on him how wrong they were. And if talk of “chips on shoulders’’ and ‘’having something to prove” can feel like over-used sports clichés, they are also the kind of thing many of the players who got the Seahawks to where they once were under Carroll often said they relied on. And they are also the kind of thing Carroll says he’s happy to add more of as Seattle attempts to get back to the rarefied air of the 2013 Super Bowl title that was driven by the likes of Russell Wilson, Richard Sherman, Kam Chancellor, Doug Baldwin and Michael Bennett, all taken in the third round or lower – or not at all — only to go on to earn multiple Pro Bowl bids and create a legacy as among the best at their positions in team history. Green also appears to fit what Seattle wants to get back to in another way — being a low-maintenance player. Carroll and general manager John Schneider talked recently of making fewer excuses for potential draft picks, hoping to limit the possibility of player flameouts after some of the draft mistakes of recent seasons. The team may not have necessarily meant Malik McDowell — last year’s first pick who may never play after suffering injuries in an ATV accident — but that incident hovers over this year’s draft. Green, in fact, was drafted in part to create the void left by McDowell — the role the team envisions him playing is basically what they figured McDowell might do. But where after the pick of McDowell last year the team faced questions about McDowell’s maturity level — which then largely grew out of an idea that he had sulked through a disappointing final season at Michigan State — on Friday the Seahawks were only praising Green’s attitude and work ethic. So if there are no questions about his character, motivation and work ethic, then how much he contributes instead will apparently be solely a matter of mundane football issues — specifically, can he fulfill the role Seattle hopes he can as an end in running downs and inside rusher on passing downs, the same role as Bennett the last five years and the role the team hoped McDowell could fill. Seattle had seven defensive ends on the roster before Friday, but that number includes Cliff Avril, who is unlikely to play again. And none of the others on the roster — Frank Clark, Branden Jackson, Quinton Jefferson, Marcus Smith, Dion Jordan or Noble Nwachukwu — are under contract beyond 2018. Seattle also lost not only Bennett and is likely losing Avril, but also saw defensive tackle Sheldon Richardson sign with the Vikings while also having apparently decided to likely soon cut ties with McDowell. “We needed a little help there,” Carroll said of the defensive line. At USC, his rep was as one of the better pass rushers in college football last season but needing some work against the run, which Carroll basically acknowledged. That basically sounds exactly like Bennett, but with the ability to eventually be a little bigger (Bennett was listed at 6-4, 274 last season). If he also arrives in Seattle a little upset, the Seahawks won’t complain.